, and if possible register, log-on and include a picture to support your record. 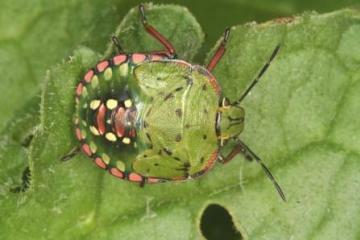 In summer 2003 three breeding populations of the Southern Green Shieldbug Nezera viridula were discovered outdoors in London (Barclay 2004, Shardlow & Taylor 2004), the first time the species had been found in Britain as anything other than a casual occurrence. The nymphs of N. viridula are distinctive, the fifth instars having 4 rows of white markings on the greenish abdomen, with red markings on the edge of the pronotum, as well as a red spot on the margin of every abdominal segment. The earlier instars are blackish brown, from at least the second instar onwards with four large white spots on each side of the abdomen. Adults most closely resemble our native Green Shieldbug Palomina prasina, but N. viridula is said to be larger, but this is not necessarily especially noticeable, and has a clear membrane, the base of the abdomen appearing green rather than brown as in Palomena. The base of the scutellum has a row of 3-5 small white spots with a small black spot at each corner. Apparently in some individuals the head and front margin of the pronotum can be cream-coloured. N. viridula has been recorded feeding on Wayfaring tree Viburnham lantana at Camley Street Natural Park near Kings Cross Station (Shardlow & Taylor 2004) and tomato plants in the Queens Park area of London (Barclay op. cit), but it has also been found on Golden Rod, Hemp Agrimony and other plants at Camley Street and causes crop damage in some warmer countries (Brooke 2004) on a range of crops including tomatoes, pecans, potatoes, cotton, grapes, beans, cabbage, citrus, cucurbits, cannabis, macadamia nuts, mango, orchids, peppers, soybeans and watercress (Shardlow & Taylor op. cit.). In the biological recording county of Essex a 5th instar nymph was first found at a brownfield site in Stratford (TQ377841) in October 2003. In August and early September 2008 5th instar nymphs were swept from herbage at a site near Stanford le Hope. In 2009 nymphs were found on runner beans at Canvey Island. Clearly this shield bug is likely to turn up elsewhere in Essex. Barclay, M.V.L. 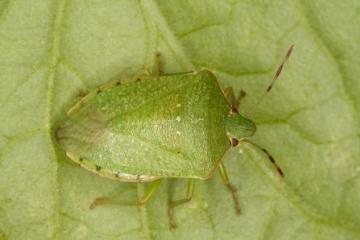 (2004) The Green Vegetable Bug Nezara viridula (L., 1758) (Hemiptera, Pentatomidae) new to Britain. Entomologist’s Record and Journal of Variation 116: 55-58. Brooke, S. (2004) Recent arrivals: The Southern Green Shield Bug, Nezara viridula (L., 1758). Het News, 4 (2nd series):1-2. Shardlow, M.E.A. & Taylor, R. (2004) Is the Southern Green Shield Bug, Nezara viridula (L.) (Hemiptera: Pentatomidae) another species colonising Britain due to climate change?.British Journal of Entomology and Natural History 17 (3): 143-146. Southwood, T.R.E. & Leston, D. (1959) Land and water bugs of the British Isles. Frederick Warne & Co Ltd.